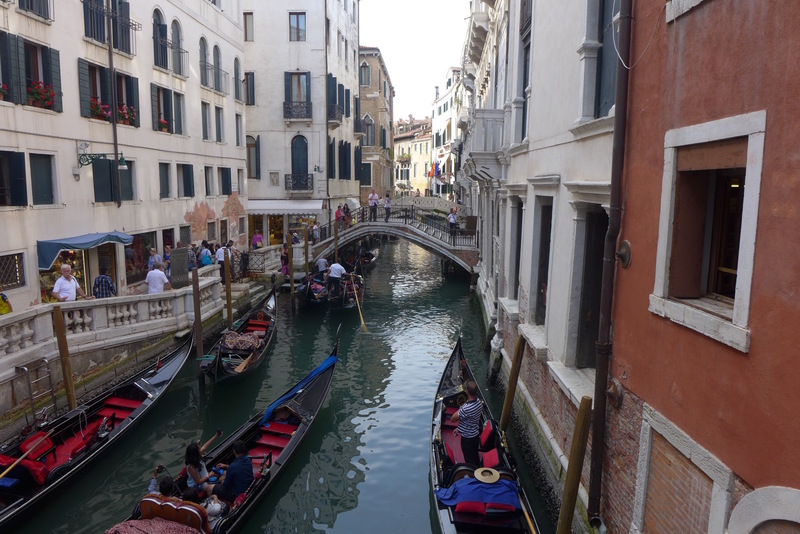 I spent three days in Venice at the beginning of June and had a really nice time. I really liked the city. It is on the more expensive side, so keep that in mind when planning your time there. 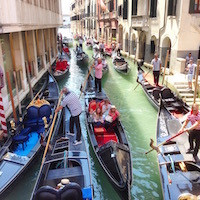 Also, I recommend going ahead and getting a multi-day vaporetto (waterbus) pass for the length of your stay in Venice. It’s a great way to get around, and the multi-day ones are a decent deal (compared to shorter ones or just paying for each ride). 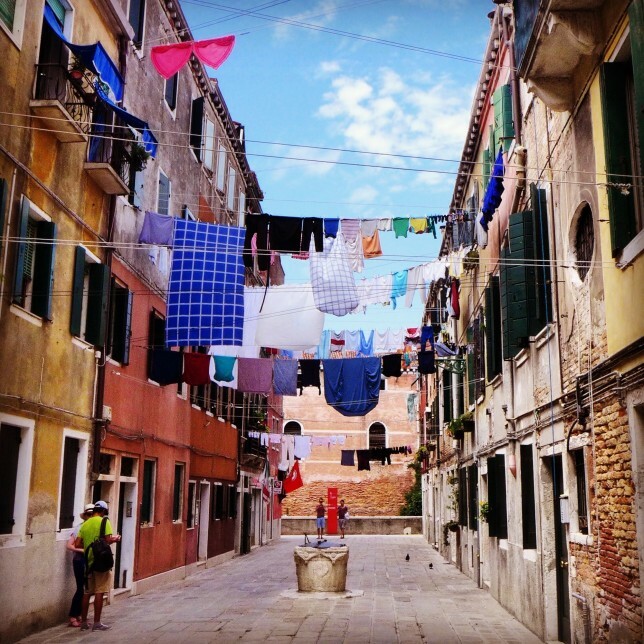 I also visited the Venice Biennale while I was there, the bi-annual art exhibit that was the original one on which other cities model theirs. It’s organized into country pavilions and is pretty cool to see, so info on that lower in the post. 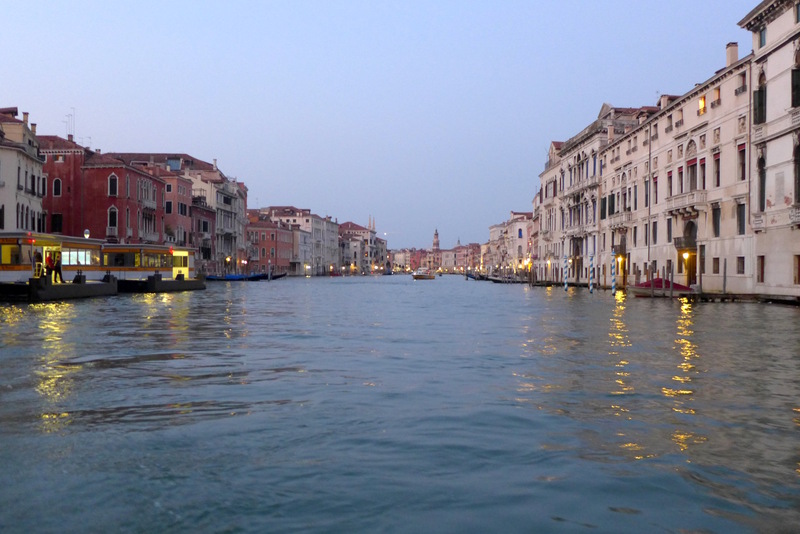 I arrived in Venice on a Tuesday afternoon via train. There was a long line at the machine for waterbus tickets, but there was a tourist information office nearby where you can also buy the tickets, and there was no line there. I went ahead and bought a 3-day ticket, the length of my stay, and I’m glad I did. 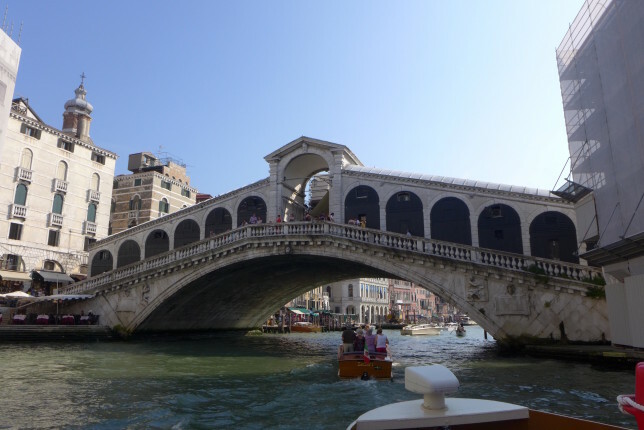 I was staying near Piazza San Marco (St. Mark’s) so I decided to take a longer waterbus trip to get me even closer to my destination and a short walk to my hotel. After I dropped off my things and got settled in, I decided to go out and wander the streets of Venice aimlessly. I figured I’d head to specific destinations the next day, so just wanted to walk around and and see the city without a plan. A fun way to first explore an area I think. 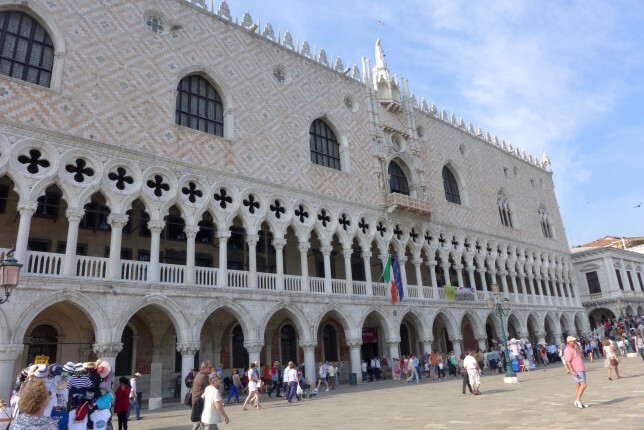 I walked towards the nearby Piazza San Marco to see the Basilica and the square and then walked on from there. 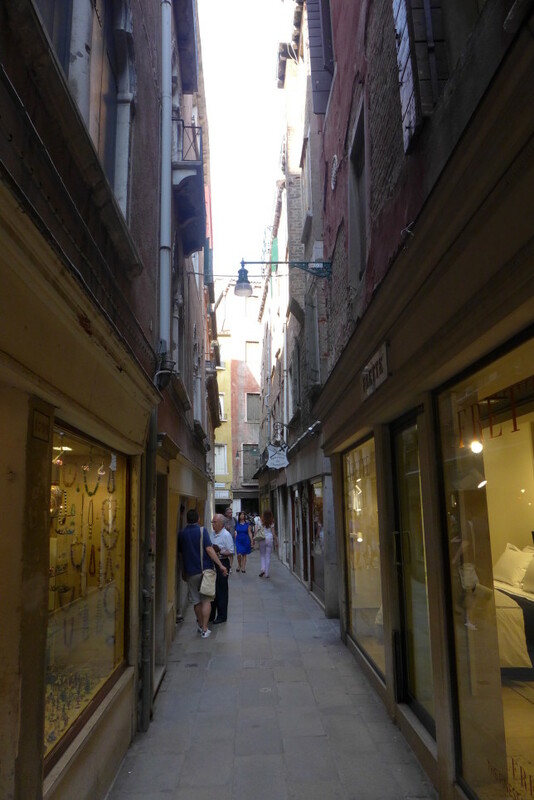 One thing I was noticing while I was walking around, was just how many shops and such you can fit in a place with pedestrian width streets and no need to have room for cars, and especially parking, buses, trains, etc. So much stuff packed in to not a ton of space. 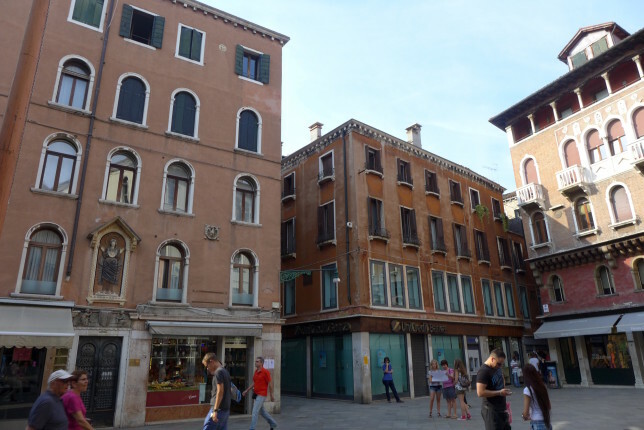 It seems like the ground floor everywhere is used for shops, restaurants, etc. I’m guessing it’s mostly homes above them all. 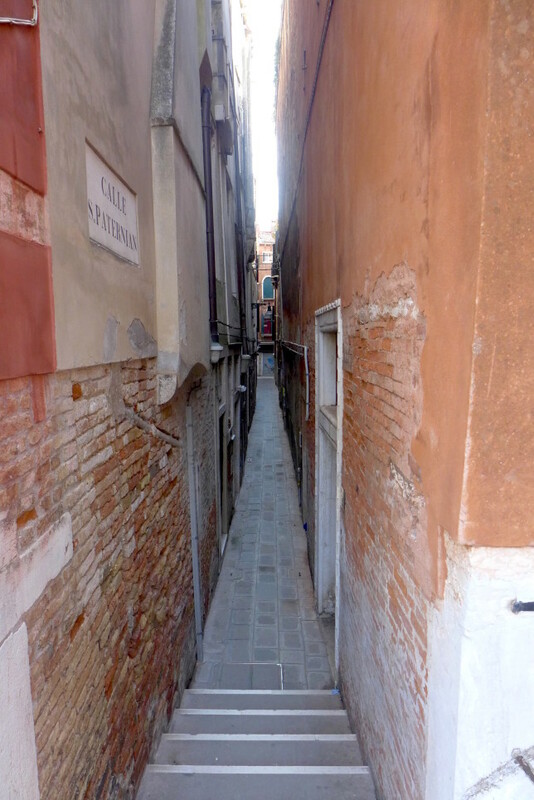 But this was noticeable throughout walking around Venice. And also made for interesting situations of people trying to deliver things, since they obviously couldn’t drive things places. I wanted something to eat to tide me over until dinner, so I got a slice of pizza and a beer and then ate it on some steps looking at a canal. It cost me all of €3,60 so I was happy with that. 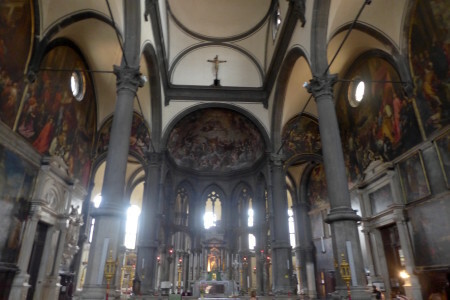 I entered Santo Stefano Church. It was a bit old and worn but I thought that just added to the beauty in a way. I went for an afternoon gelato. I did some online research and read good things about Gelateria Alaska so I went there. I got chocolate, pistachio, and ginger (they’re known for their ginger). I thought it was delicious! Great texture and flavor, the ginger was very zesty. 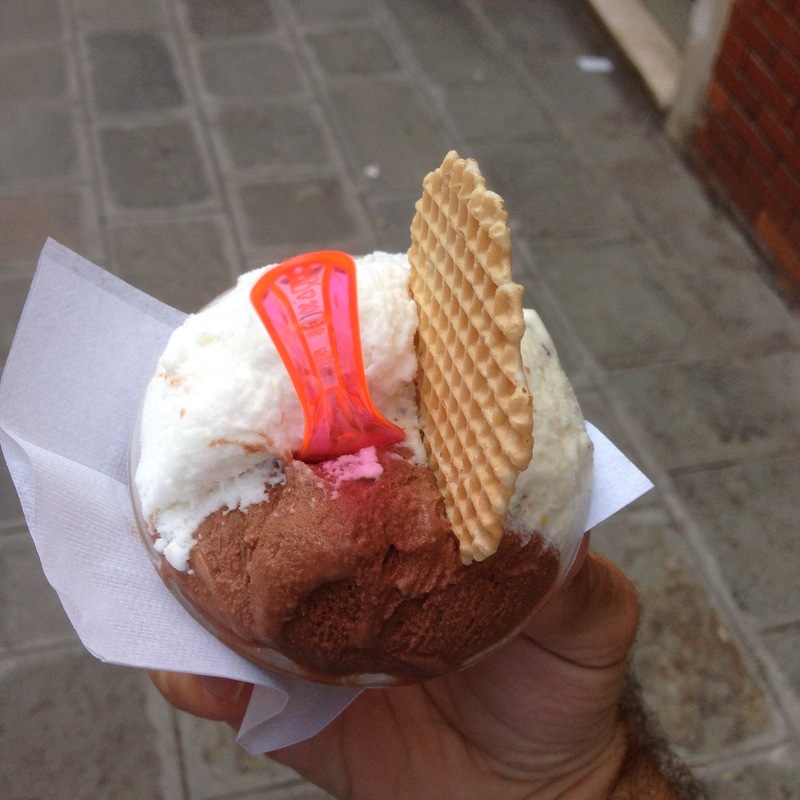 I thought it was among the best two or three places I had gelato in all of Italy. 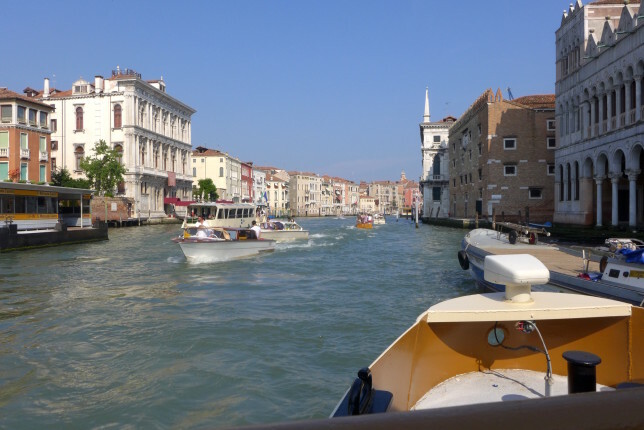 I decided to take a longer, slower route back on the waterbus, so I took the 1 boat a long way (I intentionally went the long way), with all the stops it was about a one hour trip. I got a seat outside at the back, so essentially I got a sunset boat cruise for free. This is a great way to use the vaporetto pass, it’s nice just to take some boat rides around Venice! 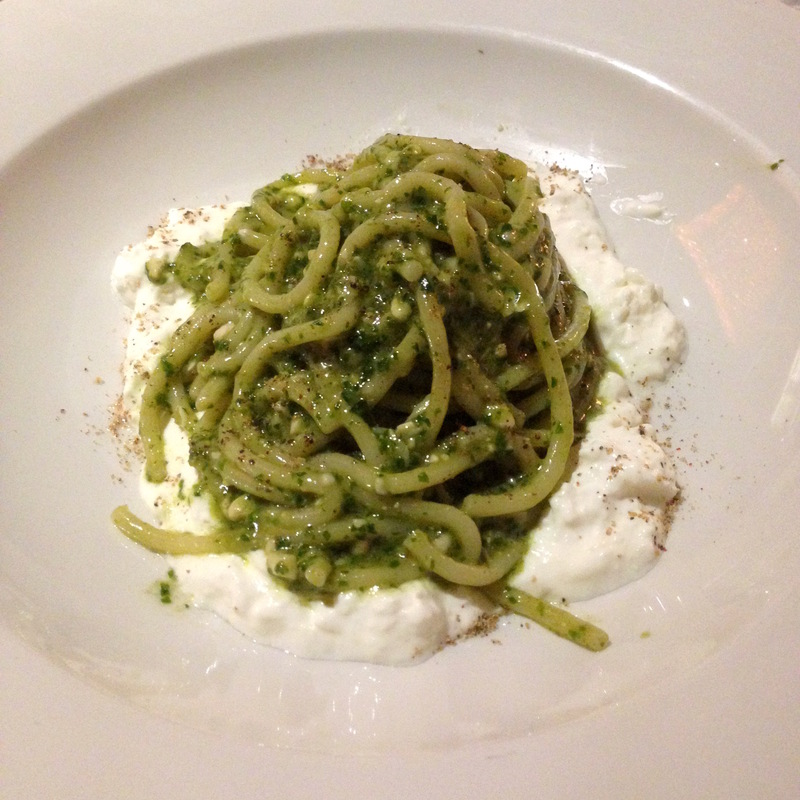 I decided to go somewhere a bit nicer than I often do for dinner, so I went to Osteria Enoteca San Marco. I ordered an asparagus gratin with pecorino cheese and quail eggs and a spaghetti with pesto and buffalo stracciatella cheese. And I ordered a glass of a chianti that was delicious. 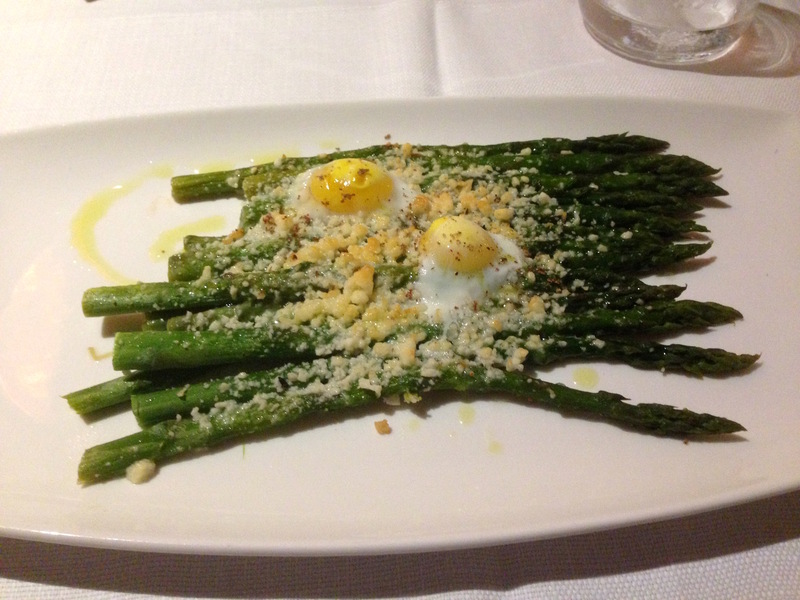 The asparagus dish was absolutely amazing. It all went together extremely well and I think it’s the best asparagus dish I’ve ever eaten! The pasta was quite good, the cheese and pesto went together nicely. This was the first pesto I’d eaten since having the bronte pistachio pesto in Sicily… hard going back to pine nuts after that. As good as it was I decided to try a dessert. The waiter recommended their tiramisu so I went for that. It was great. 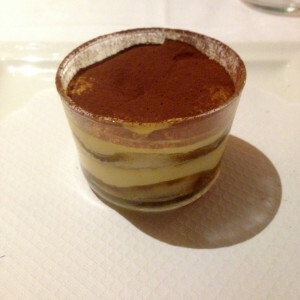 Tiramisu is one of the desserts that I feel can be more hit or miss than most desserts, but this one was very good. This was a pricey meal, but it was very good, especially the asparagus dish, that was fantastic. 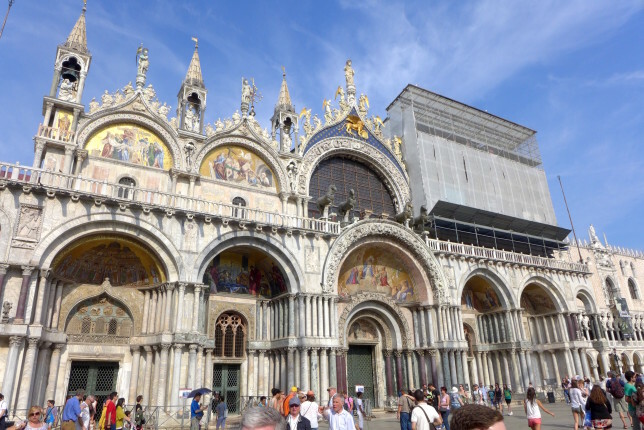 I started the next day by going to St Mark’s Basilica. The line was long, but as it’s free to get in the line moved quite quickly, since it’s often the payment process that slows things down. It does cost €5 to go upstairs where there’s a museum, but also a terrace and loggia. I think it’s definitely worth paying for that. The ceiling is really amazing. When I first entered I thought it was just paintings in a gold style, but as I saw it from closer upstairs I realized that the whole thing is mosaics with small tiles. Really amazing stuff. Great views from the upper level of the basilica. You can also go outside where you have great views of the square. Really nice place to visit. This was yet another place where I was really annoyed by all of the people taking photos despite all the signs clearly saying that you can’t. I’m tempted to start shaming these people… and I wonder if there’s some kind of international museum organization I can reach out to and be like some kind of undercover policer of these things… Anyway, needless to say I don’t have any photos inside. But it’s a place to visit for sure. 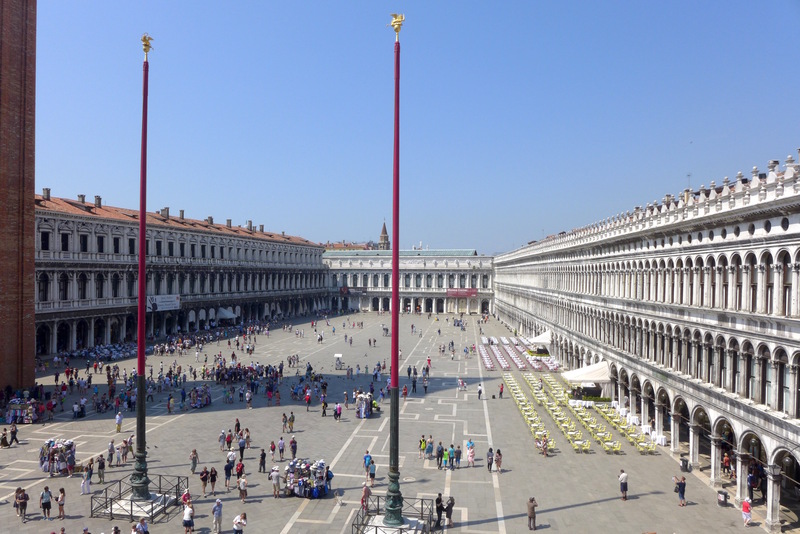 Here are a few pictures of the view of the square from upstairs. 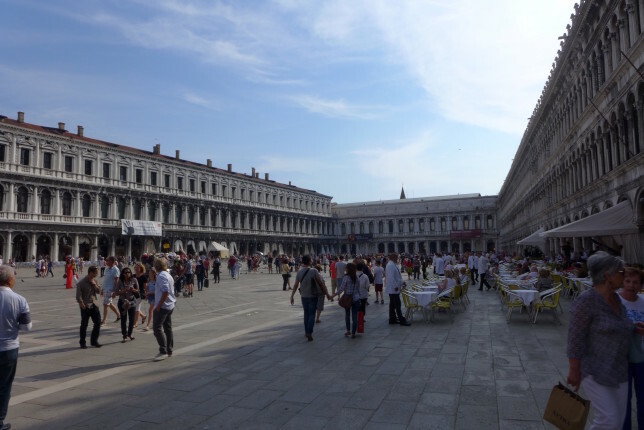 Afterwards I went walking around some, heading in the general direction of the Palazzo Grassi, but also stopped in a few interesting places along the way. I entered the Church of San Zulian, which was nice. 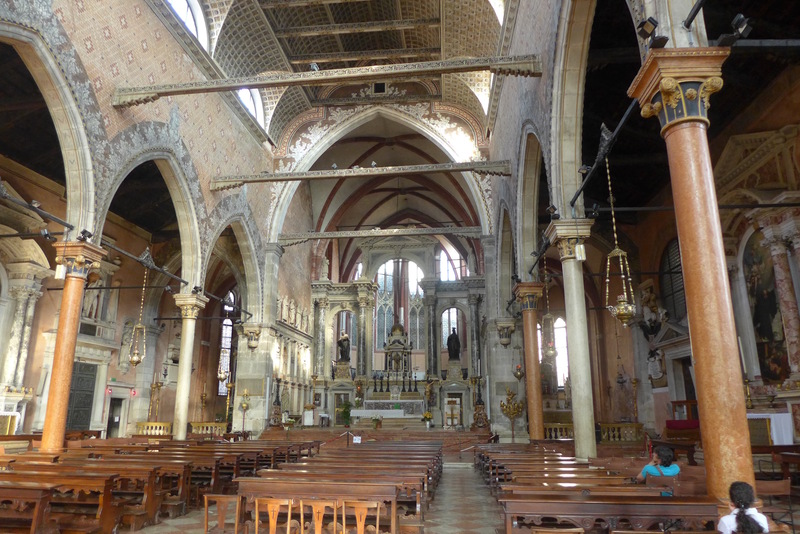 And also the Church of San Maurizio which was nice and had an interesting collection of instruments. I was glad I was walking so I could see some things along the way. I was also amused when I saw a group of 4 guys, probably mid-20s, all dressed in really bright polo shirts. But the funny part was that you could clearly see they all had the same type of around the neck, under the shirt, safety wallet type thing, because it was a clear visible square bulging through their matching polos of different colors. I thought it was a pretty hilarious sight. 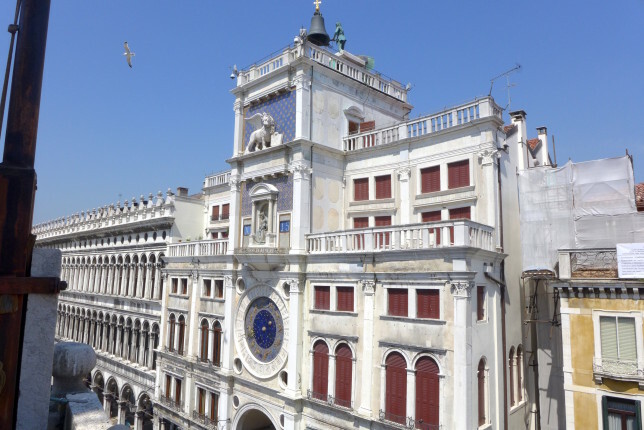 When I got to the Palazzo Grassi, I could get a joint ticket for the Dogana for only slightly, more, so I decided to do that. 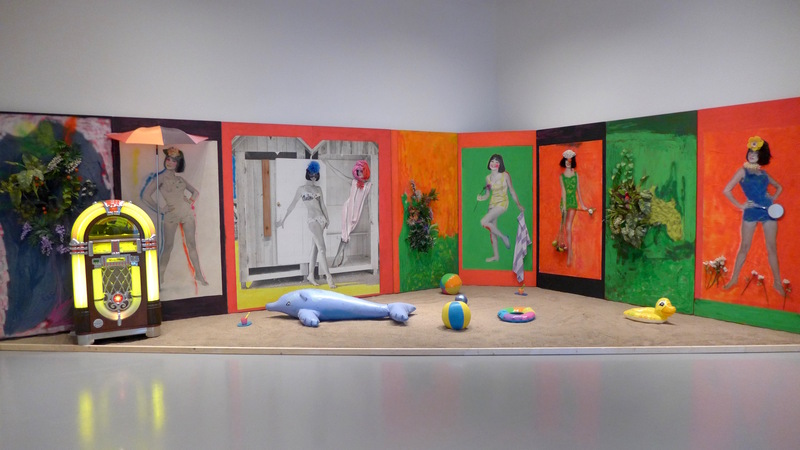 The Grassi had an exhibit for an artist that I wasn’t familiar with, Martial Raysse. The exhibit blew me away! 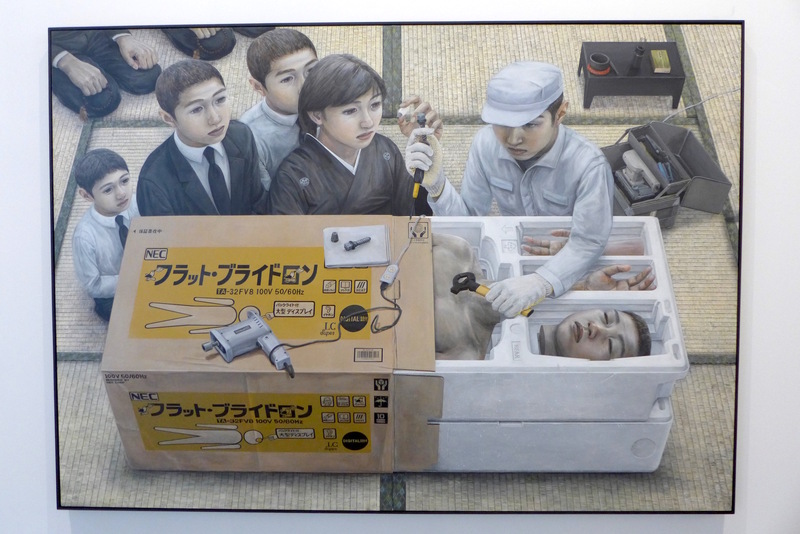 I really liked it a lot, and became a fan of Raysse’s work. 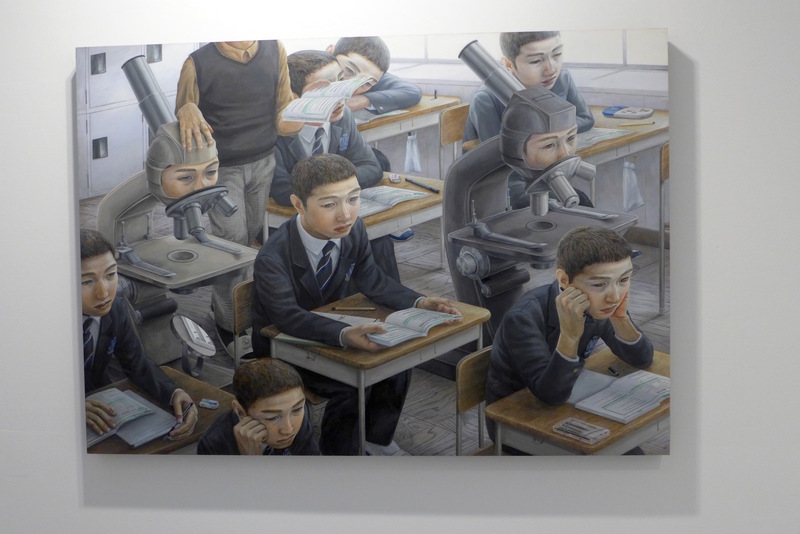 I thought it was such an interesting mixture of mediums as well as just being some wonderful art. Also some interesting experimental work. Really, really good stuff in my opinion. 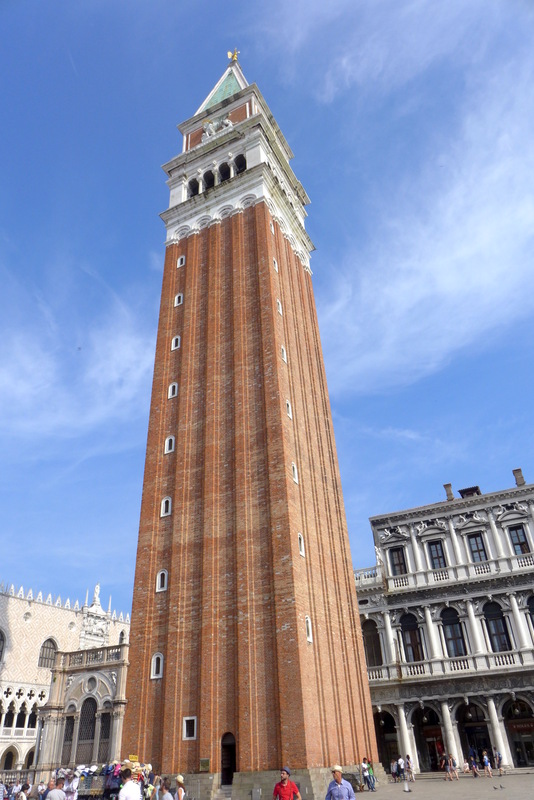 Afterwards I went to the Gallerie dell’Accademia, which I also enjoyed. 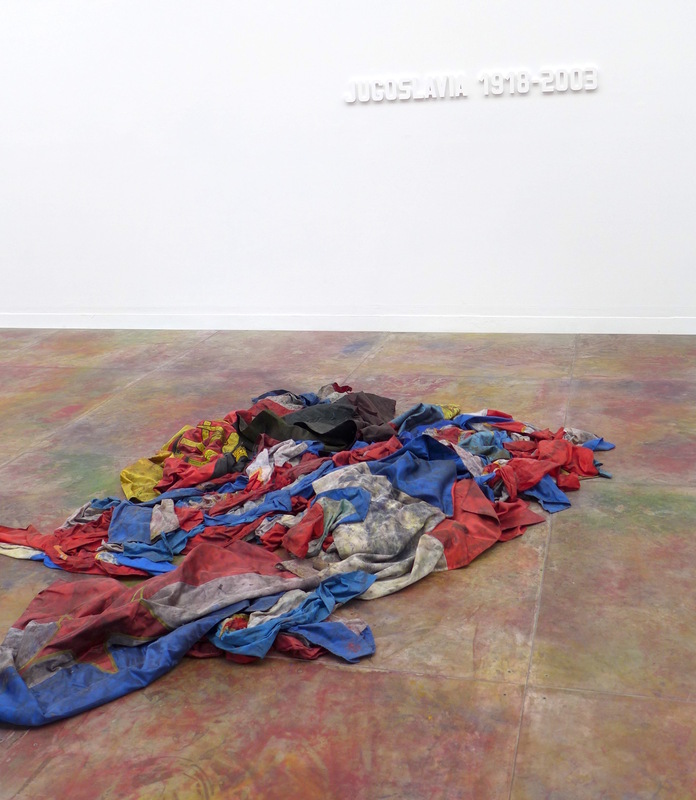 And was an interesting contrast after Raysse to see lots of old oil on wood paintings. 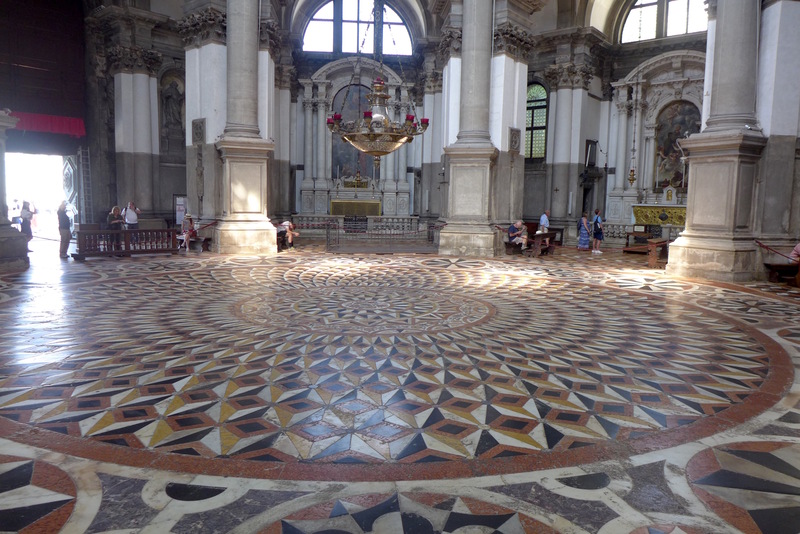 There were some massive Tintoretto works, Titian, etc. A nice stop. After that I went to the Peggy Guggenheim Collection, which is a modern art museum. I thought it was amazing. Really kind of nuts the type of stuff they have there and all the amazing artists whose work they have. A really amazing and eclectic collection of art from the last hundred years. Very cool and a must see museum in Venice. 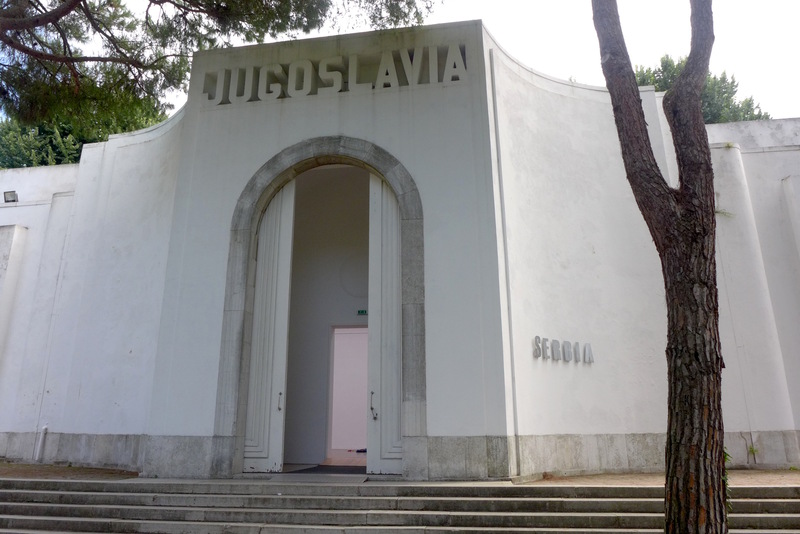 They had works from artists like Picasso, Dali, Chagall, Mondrian, Pollack, Kandinsky, and so many more. And then even a Jenny Holzer piece in the garden. While I was there the exhibit was on Charles Pollack, Jackson Pollack’s brother, and it was great too. 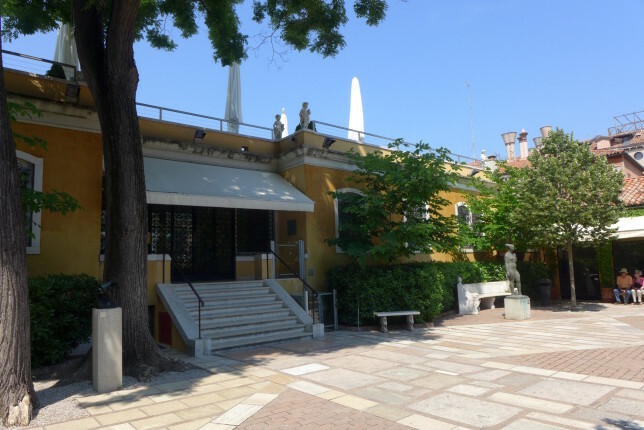 The great building it’s in, which is right on the water, was Peggy Guggenheim’s home for several decades, quite the place! 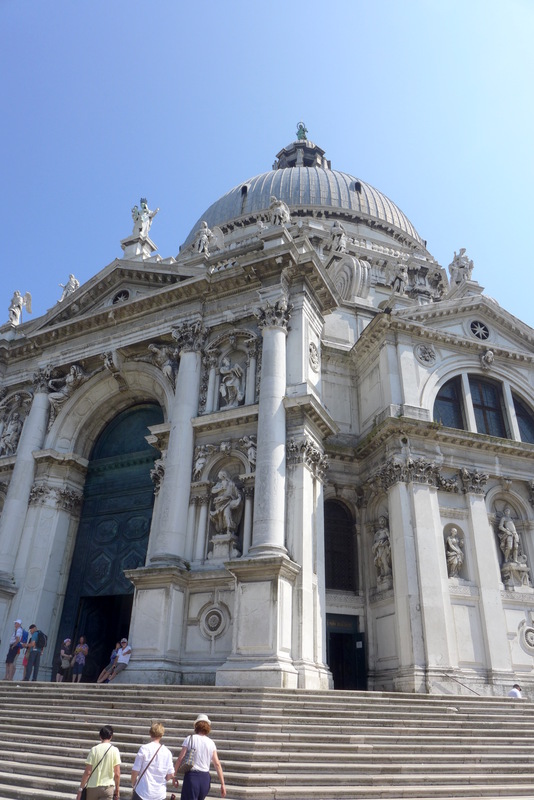 I next went to the Basilica di Santa Maria della Salute. I though it was quite pretty. 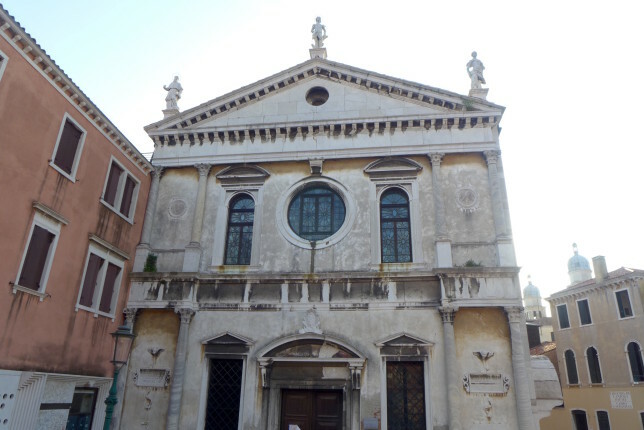 I’ve also noticed in the old churches of Venice that they often have a slight mildew smell to them. And if you look around, you can often notice some water damage too, on the lower parts of the pillars in particular. The rising water levels that happen must be tough on the lower parts of these old church. 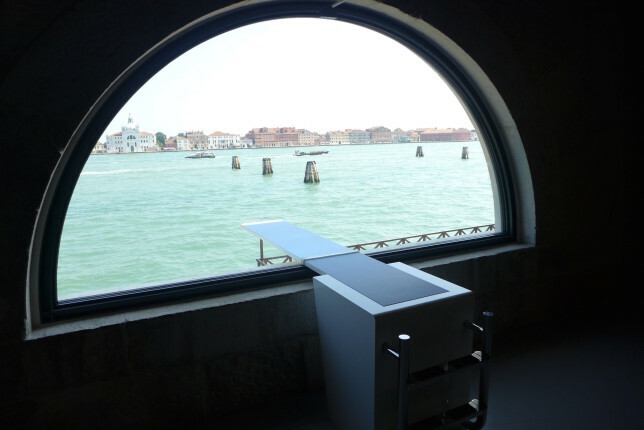 Next I went over to the Punta della Dogana. 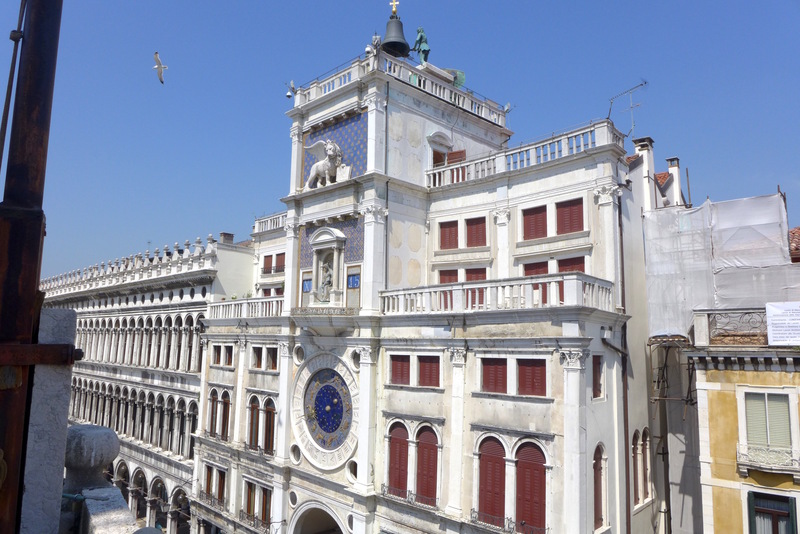 When I got the ticket to the Palazzo Grassi it was €5 more to add the Dogana so I decided to do it. It’s in a cool waterfront building that used to be the customs house. I enjoyed seeing the building. The art that was there at the time I thought was only okay compared to some of the other place I’d been. But that with the building I did think was worth the €5, though I might have been a bit disappointed if I’d paid full price. 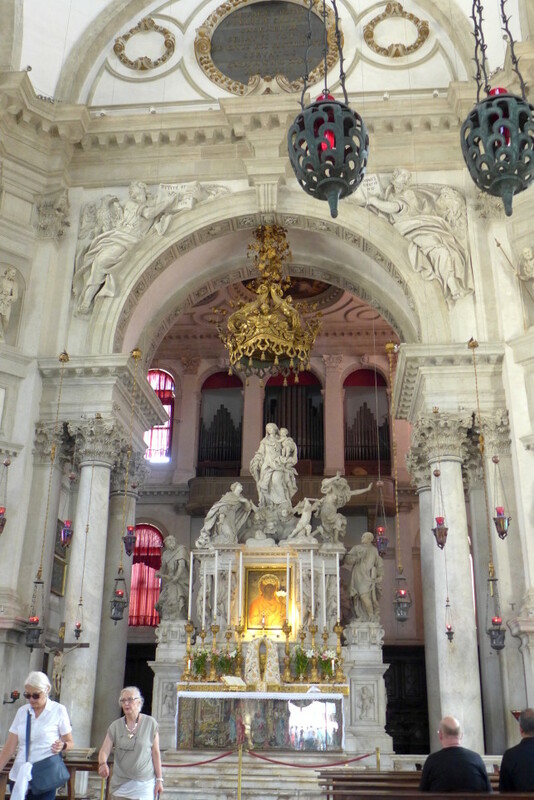 Next I went to the Gesuati, the common name for the Santa Maria del Rosario. It was nice, it even had a fresco by Tintoretto. I then took a waterbus, and got a seat in the very front, outside. Which was great, like another tour on the water. I really recommend making as much use of them as possible, it’s like you get canal cruises whenever you want, especially with a good outdoor seat. 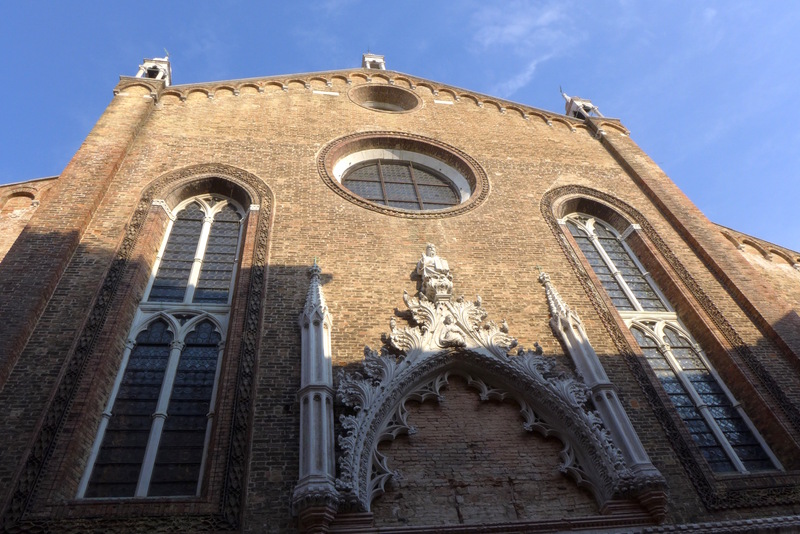 I then went to I Frari which I thought was great. Big and pretty, nice wooden beams and a beautiful wooden choir section. Some great paintings and works there too, including a gorgeous Titian painting over the alter and a work by Donatello. No photos allowed, so I didn’t take any. Definitely worth visiting while in Venice. Got front most seat in an express waterbus. Awesome. And a nice place to sit and rest. Making good use of them is a lot of fun. 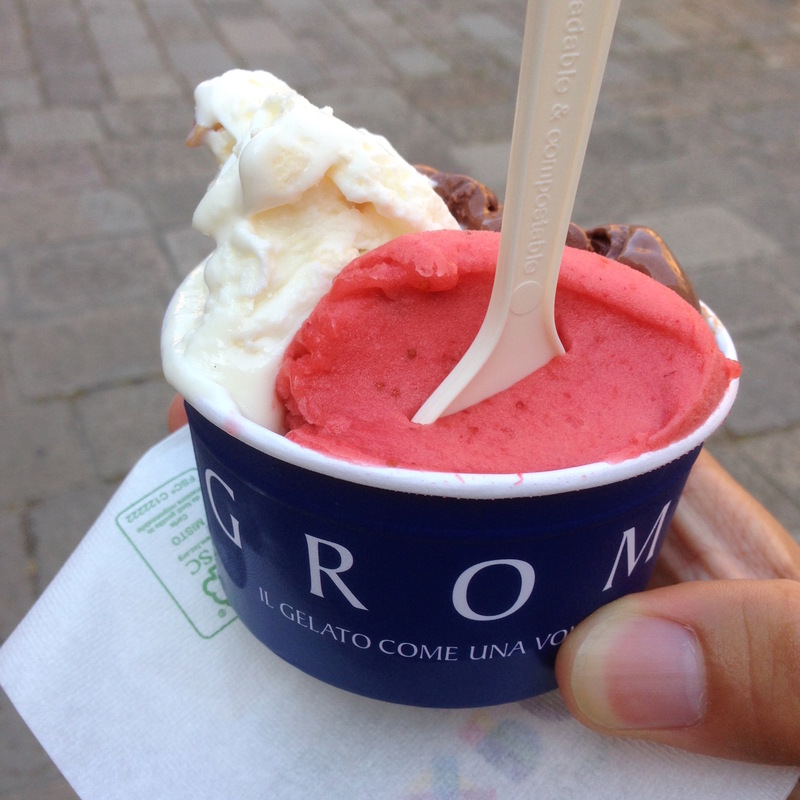 I felt like some gelato, so I finally tried Gelateria Grom. They are a chain you can find all over Italy, but people speak well of it so I figured I’d try it. 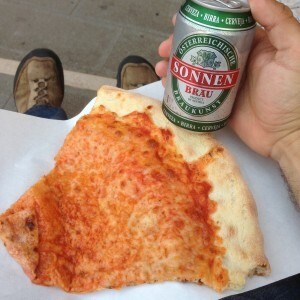 It was quite good, better than I expected, especially from a chain. I got chocolate fondente, strawberry, and the flavor of the month. They were all good, especially the chocolate. Not as good as some of the best I’ve had, but better than the majority of the totally random places I tried that I hadn’t read or heard about first. After the expensive (but quite good) dinner from the night before, I wanted to keep it cheap, so I got some takeaway pizza and a decent bottle of wine and ate back at my hotel. 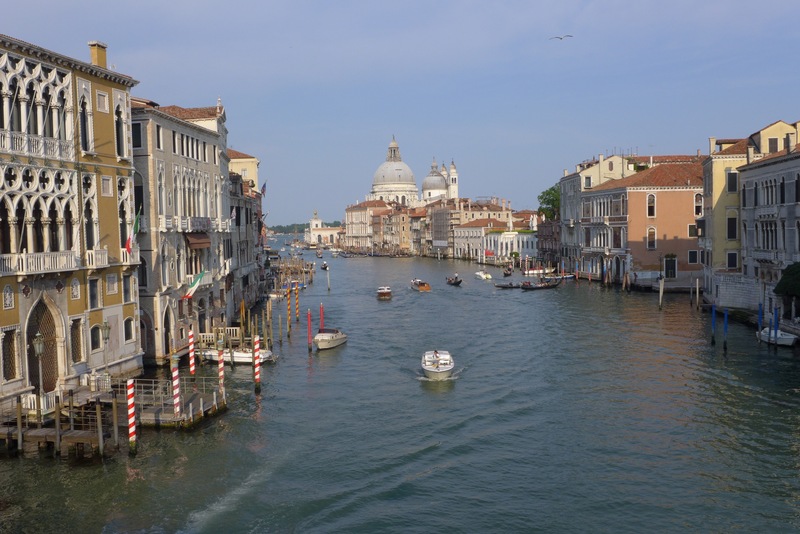 Venice seems like a city where it’s hard to keep to a lower budget, I was definitely spending more than elsewhere in Italy. But it’s great so worth a short trip where you can do and see a lot. Later that night I went over to Harry’s Bar, it’s something I knew I had to do in Venice. 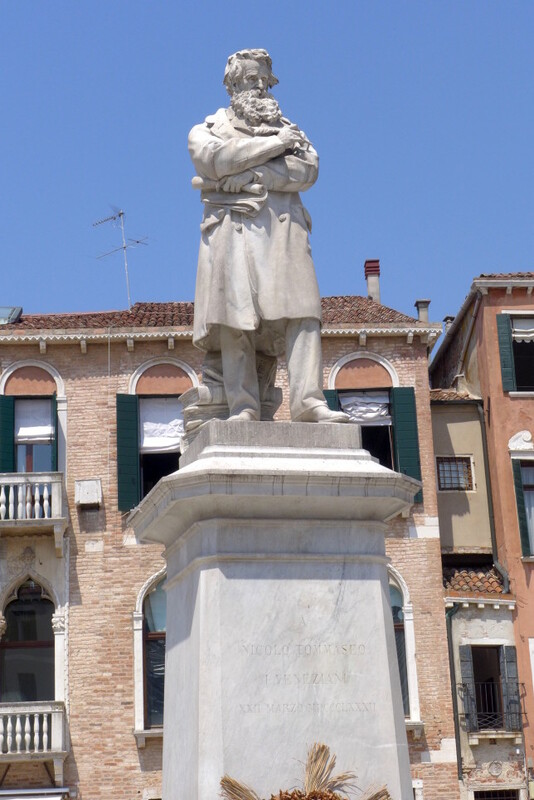 They created the bellini and are well known as being a favorite drinking spot of Ernest Hemingway. They are famous for their martini which they make very dry and with gin. As a fan of gin martinis I knew I’d be having one. This place is not cheap, the drinks are in the range of €16-€18 each. But if you like great drinks, and some history, and talking with interesting bartenders and possibly having some great conversations with other patrons, it’s definitely worth stopping by. So I knew I wanted to try their bellini first, after all they invented it. I thought it was delicious with a great peach flavor, definitely sweeter than I usually like to drink, but was a good start. The bar was full when I got in, so I was sitting on a bench by the door at first, but shortly after I got my bellini a space opened at the bar so I moved over there and sat down. After that was finished, I ordered their martini. The martini comes very dry in a chilled, small stemless glass. They give you a bowl of delicious green olives with it. It was great, really good. 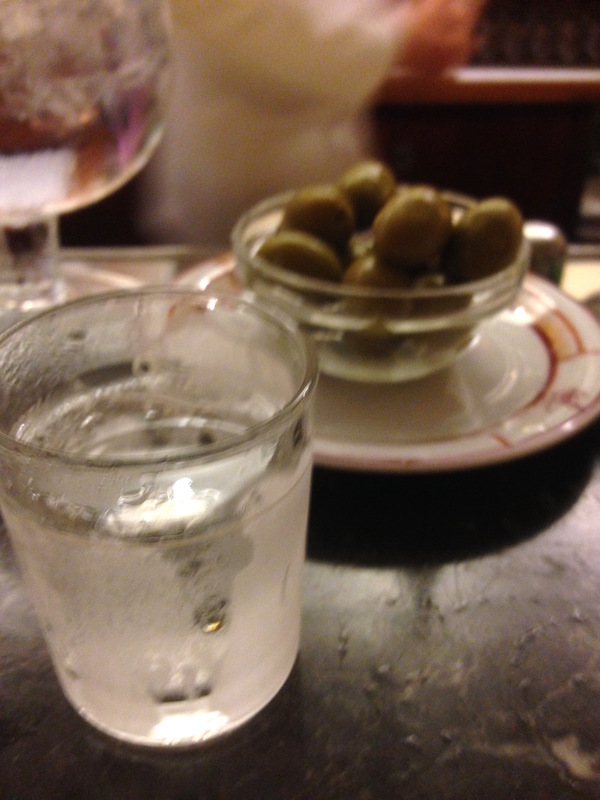 Also, what I enjoyed and seemed like a classy touch, as I was sitting at the bar and sipping on the martini, from time to time the bartended would get out a fresh chilled glass, and pour what was left into that. So it was in a cold frosty glass the whole time. I had a nice conversation with an older couple that was visiting Venice while I was drinking the martini. They left as I was finishing it up and another couple came in and sat at the bar, that looked like they were in their early 40s. I had been chatting with the bartended a bit as well, he was talking to me about the history of the place and so forth. After I finished the martini I asked him if there was anything else that I should try after the martini. He said well, I could make you an Alaska. And then he proceeded to tell me about it. He said that it’s a great cocktail and it’s mentioned in the Savoy cocktail book in the 1920s. It’s made with gin and yellow chartreuse. It was popular back in the day, but people don’t drink it much anymore, so it’s not on the cocktail list at Harry’s. He also told me that it needs a special kind of yellow chartreuse and that they stopped making in the mid-90s, and the current stuff just doesn’t work. They only had a bottle and a half left of it at Harry’s, so once it was gone they couldn’t make them any more. That sounded too fascinating, so of course I got one. So as he started making it, the guy from the couple that had recently arrived asked the bartended to make him one as well. I thought the drink was delicious! Great taste and a bit different. Very glad I tried it. 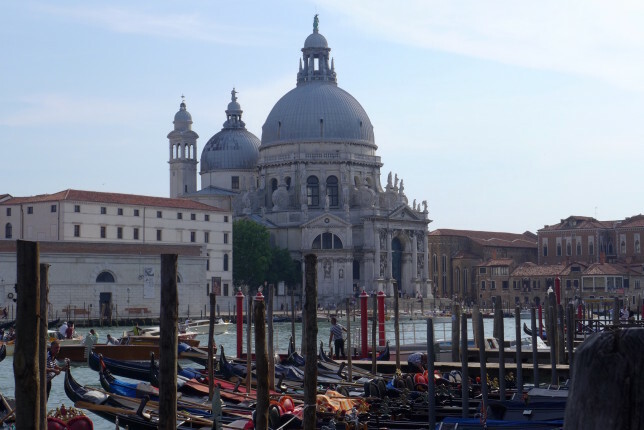 I ended up chatting with that couple, they’ve been coming to Venice for years, and always come to Harry’s when they do, but he just gets the martini. He heard my conversation with the bartender and thought it sounded like a great and interesting drink so tried one too. They were in town for the art show, the Venice Biennale. I knew it was around, but didn’t know a lot about it, so they were telling me more about it and that I should check it out. I was telling them about some of the art I’d seen, and in particular how much I enjoyed the Martial Raysse exhibit. It turns out, the couple lives in Milwaukee, which is where I grew up, so pretty funny stuff. We chatted about art, my travels, Milwaukee, etc. Also something I thought was an interesting and astute question, he said that he could tell that I was a person with a lot of energy, so if work doesn’t get all of that energy, where does it go now? I think that question actually leads to something I’ve noticed in general about this lifestyle which is something about being able to be more present and aware and enjoy all the various parts of life and experience, and maybe an abundance of energy that isn’t going into working hard at a demanding full-time job is part of that. Anyway really enjoyed the Alaska cocktail a lot, and meeting great people and having great conversations. A proper night out at Harry’s Bar. And, much to my surprise, they even picked up my drinks for me, a bit of a tradition at Harry’s as well, as it was in the old days. Anyway, great night there, three great drinks and I’m especially glad that I chatted with the bartender and got to try an Alaska. Really nice night out. I started the next day with a stop at the Church of San Zaccaria. It’s definitely worth a stop when near St Marks. 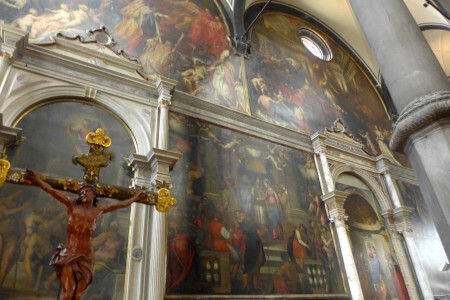 It’s covered in beautiful, dark frescoes. 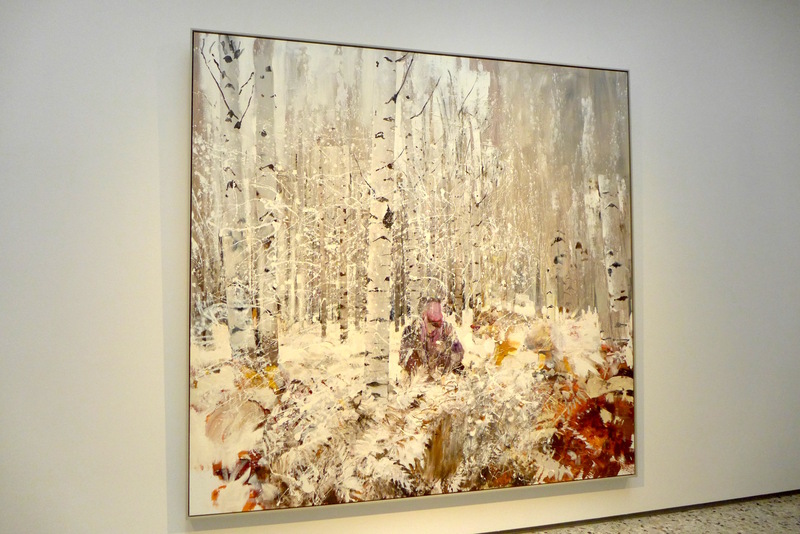 So much of it is covered in paintings, it’s cool to see. 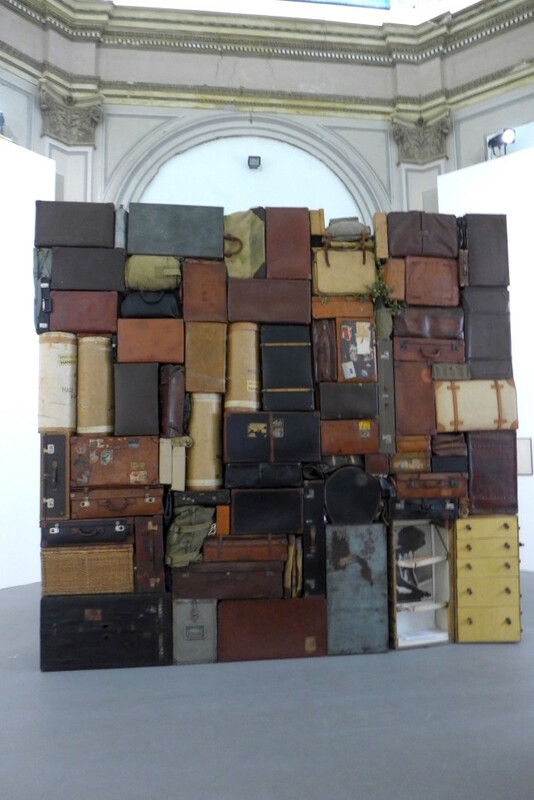 So, for the bulk of my third day I decided that I did want to go to the Venice Biennale. 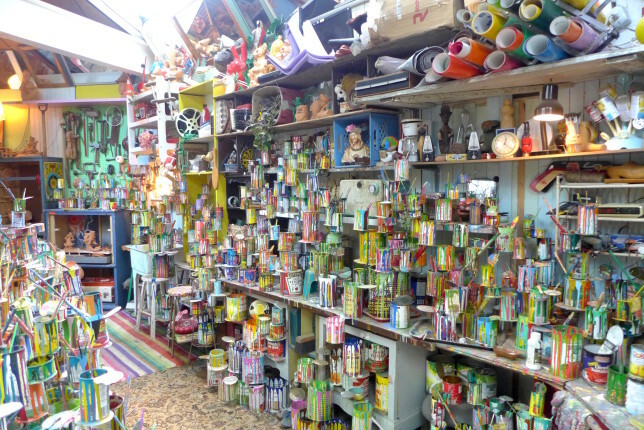 I had seen most of the major sights that I wanted to, it sounded really interesting after discussing git the night before, and after seeing country pavilions at the Milan Expo 2015, I was curious to see an art show based around country pavilions. There are lots of country pavilions in one area, and then you later go elsewhere where there’s a lot more art. It seemed pretty cool, right away. After a few countries I went into the big pavilion. Lots of cool stuff, including a big Walker Evans collection. 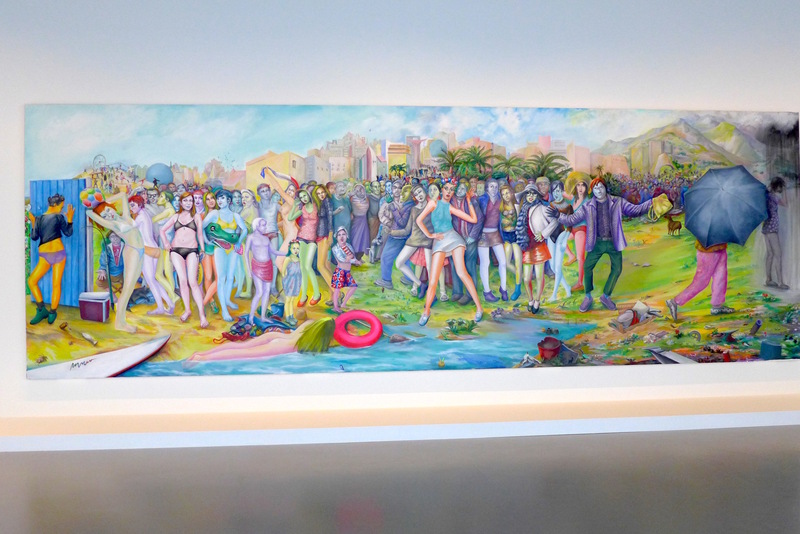 I find myself just walking around, smiling, looking at all kinds of great and interesting art. 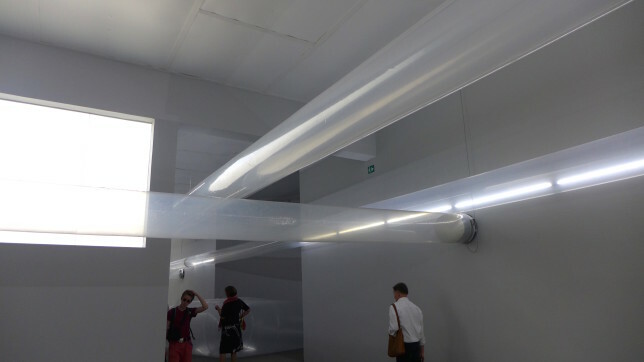 Hungary had an interesting installation in their pavilion utilizing tubes, light, air, and sound. It was fun. I thought the Serbia pavilion was great and powerful. It’s inside a building that was made in the early days of the Biennale so the building is labeled “Jugoslavia”, with a Serbia label on the side. The exhibit is United Dead Nations, showing dates when nations existed and ended, and made up of their now defunct flags. I found it really interesting. Poland had an interesting project. 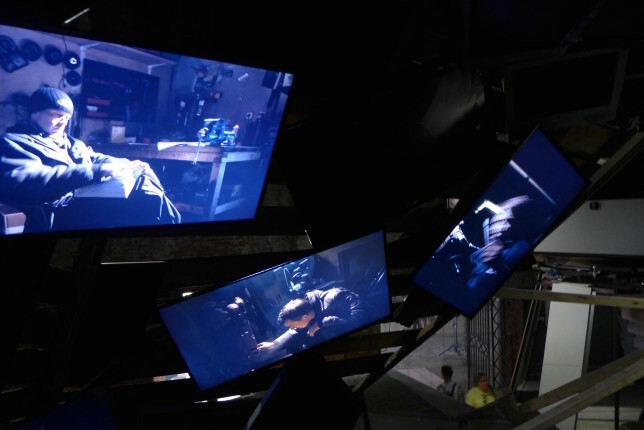 They had performed an opera on the streets of Haiti, so in their pavilion they were showing a super wide screen multi-camera format of it, it was three screens wide so showing the entire street of this small Haitian village where a Polish opera was being performed in the street for free. Pretty cool. 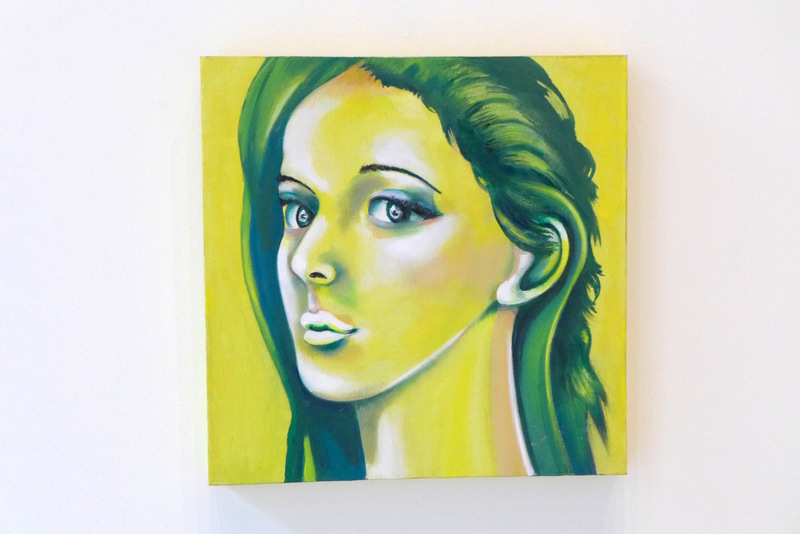 I enjoyed the paintings from Romania. Switzerland had this big bubbling pool of pink liquid, a big room with green light, some audio when you first enter. I thought it was interesting and rather odd, and thus kind of cool. Japan I thought had a great pavilion. Upstairs they had videos where they asked kids “how did you come into this world?” which elicited a wide variety of answers: sweet, funny, and charming. 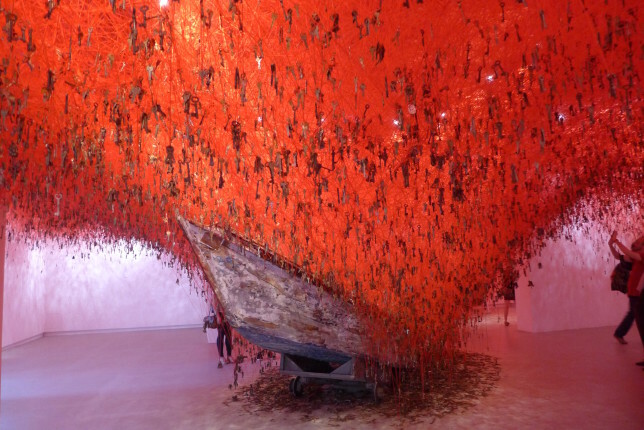 And then they had this massive “Key in the Hand” exhibit where a big room was covered in yarn, keys, a couple of old boats, really fascinating. I loved the Korean Pavilion. 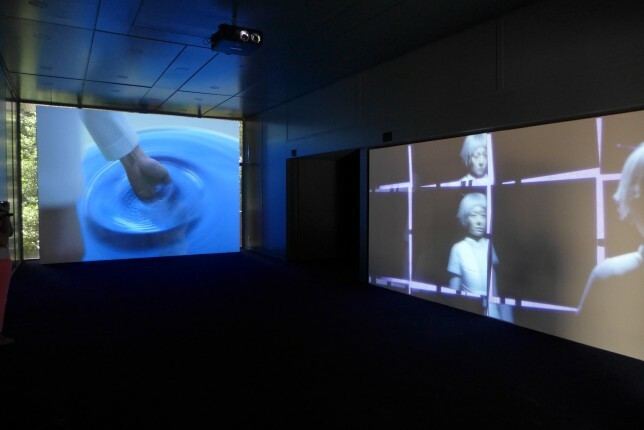 It had this SciFi video art installation multi channel film. It was really cool. I stayed to watch the whole thing. Fascinating, and gorgeously done. A bunch of other Pavilions were quite enjoyable too, and it was great seeing all the different ones while walking around. 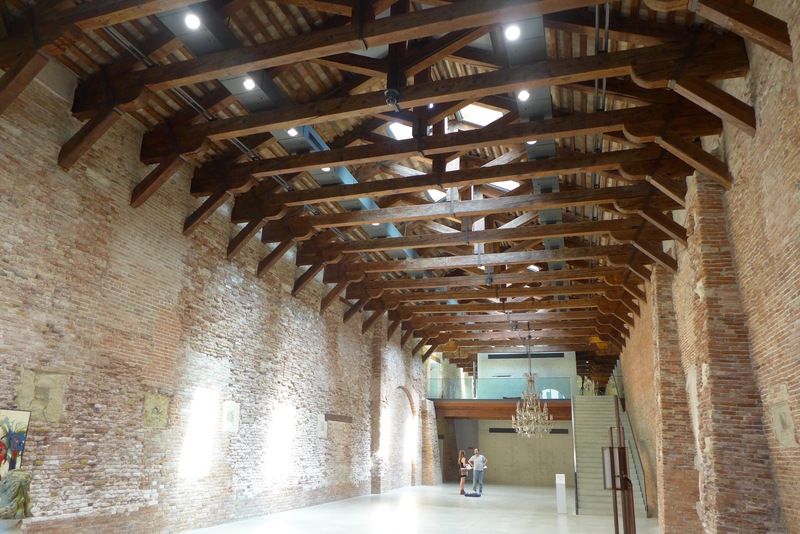 More exhibit space was in the Arsenale, so I walked over there to see more of the Biennale. 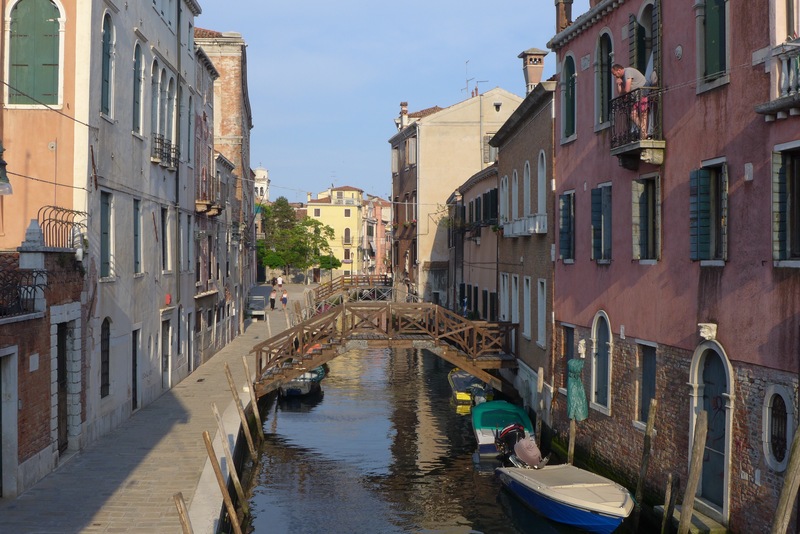 It was a nice walk over there as well, because I was seeing parts of Venice that looked a bit different than where I had spent the last couple of days, wider streets and just different scenes, very cool as well. I really liked the South Africa exhibit, it felt very strong and powerful in it’s message, of “What Remains is Tomorrow”. Turkey had some cool neon-lit images that was like a stained glass treatment of photos. 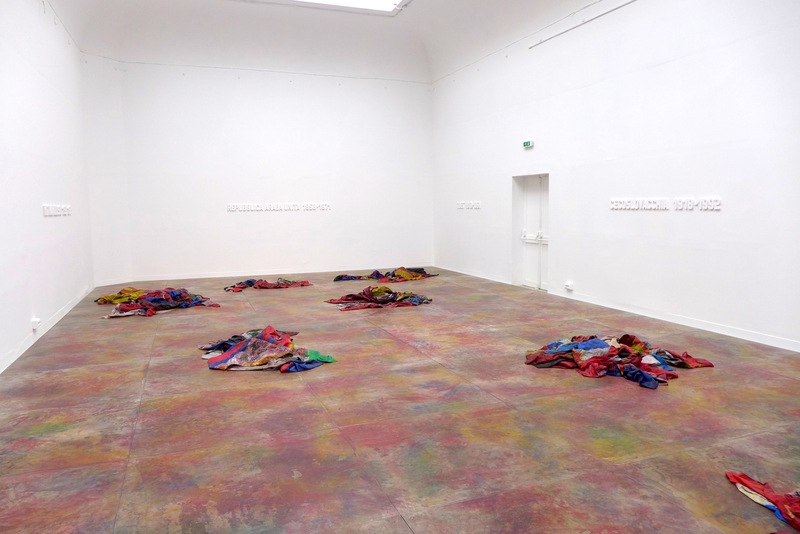 Slovenia had a nice installation. I thought Tuvalu had a nice water installation intended to bring awareness to climate change and water level issues. Latvia was a pretty fantastic and impressive installation, like a massive high tech garage with lots of video screens and other stuff, it was cool. 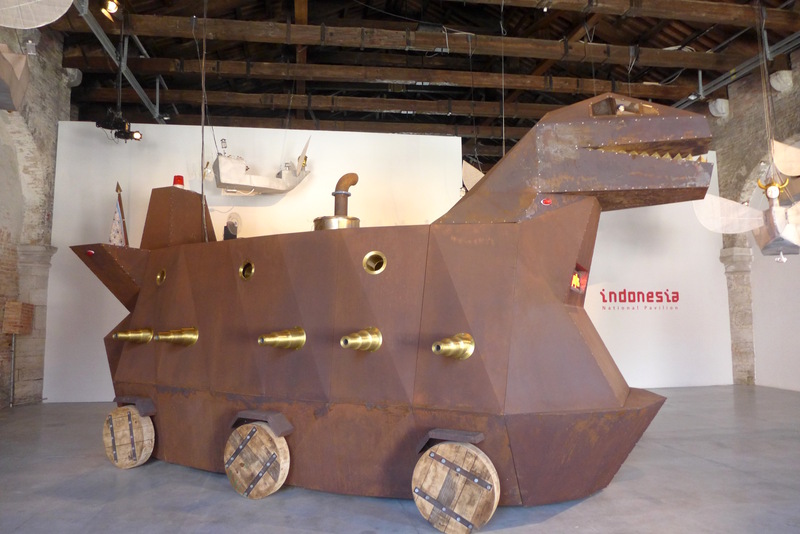 Indonesia had a Trojan Komodo Dragon that had all sorts of parts and details to it, including small scenes you could view inside each of the “guns”. Overall I thought it was a very enjoyable day at the Biennale and I’m very glad I went. I was there for 6 hours and had a great time. I left around 4:30pm, which was too late to see too much else in terms of churches, etc, as they’d be closing by the time I got there. 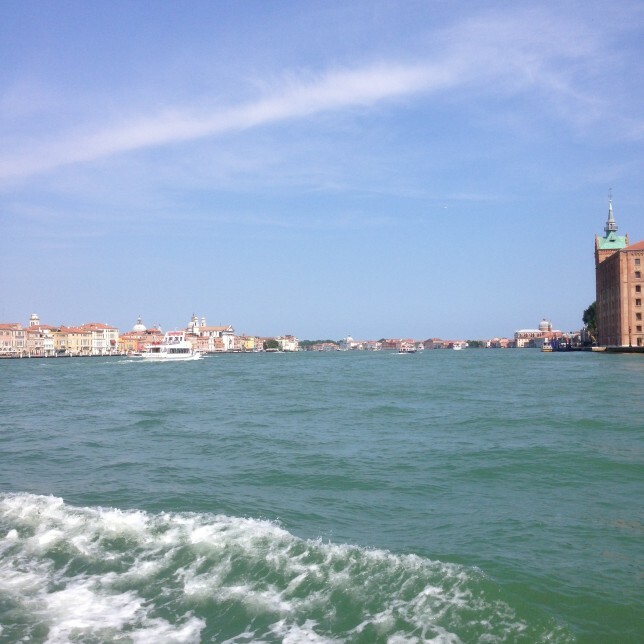 So I decided to take a waterbus over to the Lido and check out what the beach scene looks like for Venice. It’s a nice trip over there and was cool to see. 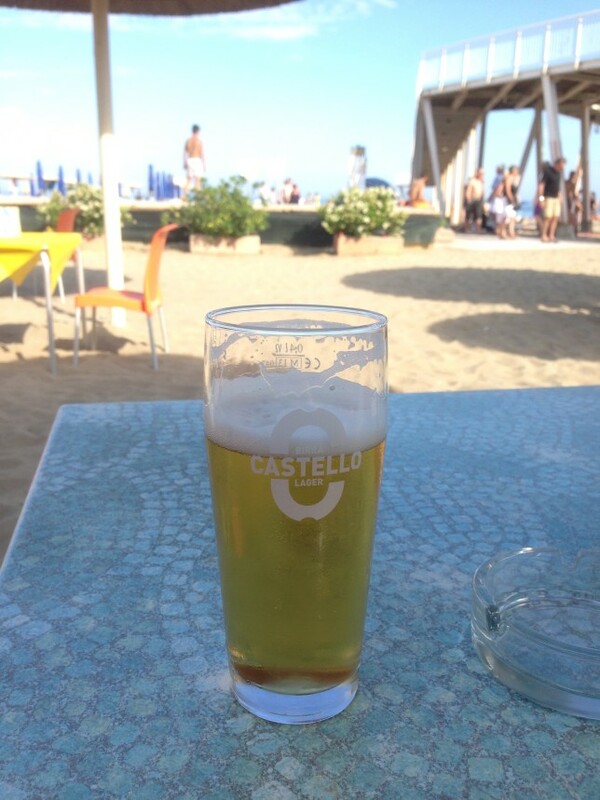 I sat on the beach and enjoyed a cold beer. 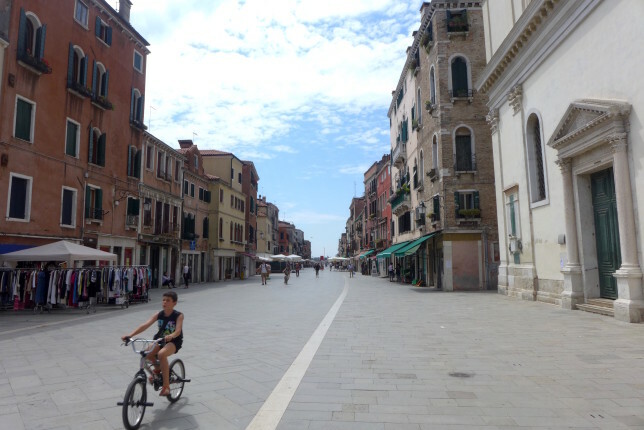 If you’re in Venice longer and the weather is nice, this would be a great place to spend an afternoon at the beach, swim some, etc. I was glad I stopped by at the end of a day on my feet. I decided to stop by a Co-op and buy some food to eat for dinner back in my hotel, and I still had some good wine left over from the night before. 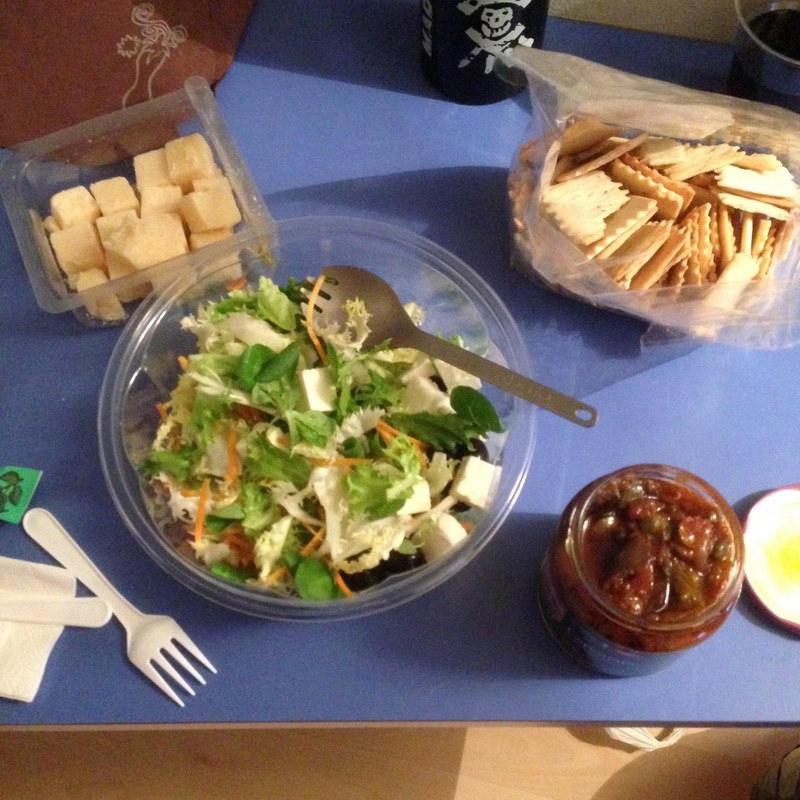 So I had a quite tasty dinner of a greek salad, and some crackers with caponata and grana padano cheese. You can see my awesome titanium spork in this photo, nicer to eat with than a plastic spork and lightweight so a nice addition for long-term travel. The next day I was leaving town, but I was leaving in a rental car that I booked at the airport. So I took the waterbus that goes to the airport, it’s about a one hour trip. Seemed kind of funny taking a boat to get to an airport, but a nice trip. 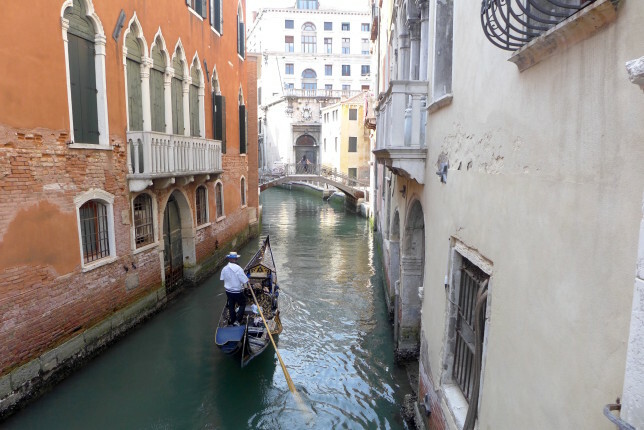 I really liked Venice. 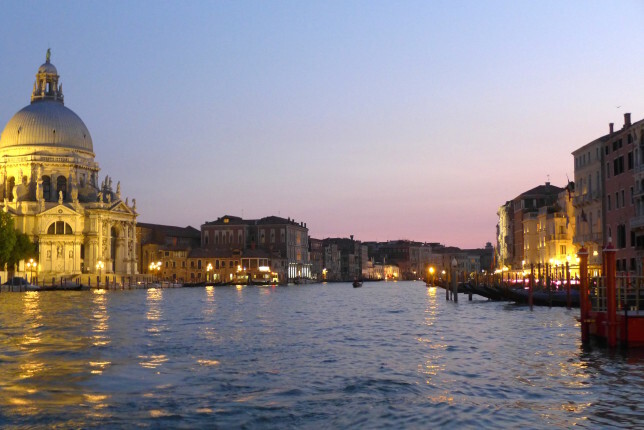 I’d love to come back sometime long enough to use a 7-day waterbus pass, which is only €10 more than the 3 day. I had a great time at the Biennale, and I’m glad I went, but that also left the list of things I thought about doing, that I didn’t get a chance to do, longer than I expected. 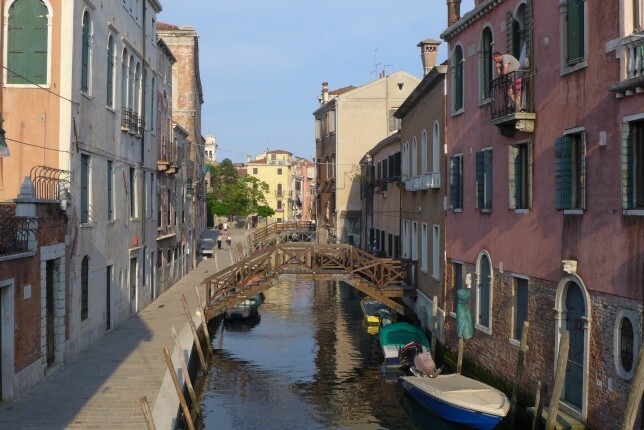 Didn’t really get to Cannaregio or Castello much, I’d heard nice things about Burano island and in general just some more churches and museums I didn’t make it to. 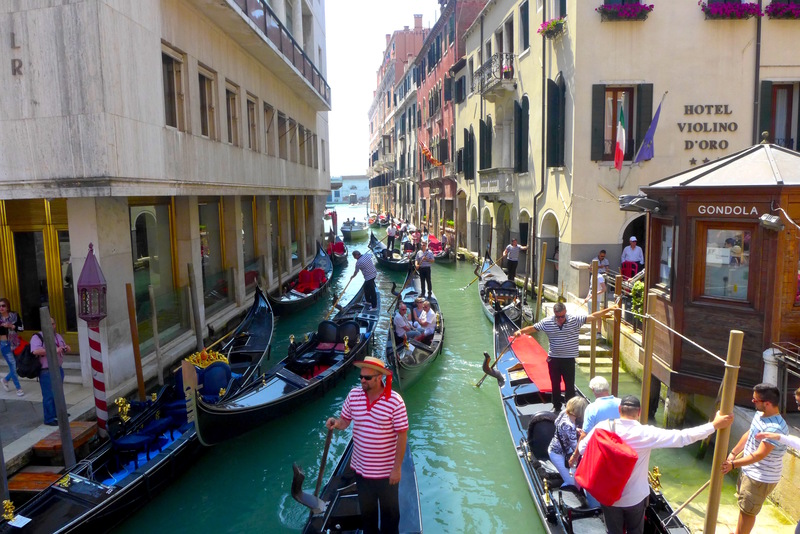 It is a pricey city, especially with accommodations so worth trying to book those early. I did have some people tell me that they thought Venice was a bit overrated, but I didn’t feel that way. I really enjoyed it, especially all the great time on and near the water. I could see it being less enjoyable in July or August when it gets really hot, but late May to early June in Venice is wonderful. Dude I can’t believe how good that martini must have been. And then you got your bill picked up by your new friends. What a perfect night!